Chef Cindy Wolf's daily menu corrals the best of the season into a series of unforgettable dishes, all graciously served in elegant surroundings. : Southern sensibilities meet big-city sophistication, and diners are the lucky beneficiaries at chef Cindy Wolf's and co-owner Tony Foreman’s Charleston. From its gleaming open kitchen comes low-country Carolina cooking backed by French fundamentals. Wolf’s daily menu gathers the best of each season into a winsome collection of elegant eats, while Foreman’s commanding wine list offers a chartered tour of world viniculture. Put this together with professional service and a richly hued interior to see why the place is a second home to city scenesters. 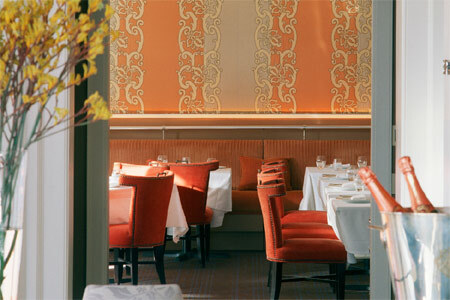 The format is a prix-fixe tasting menu featuring three to six courses of small plates. How to choose, when the offerings include a rich, intense lobster bisque, pan-roasted wild rockfish with polenta spoonbread, Hudson Valley foie gras with ripe local strawberries, or grilled lamb tenderloin with crispy grit cakes and carrot purée? Desserts? Yes, please; perhaps a lush toffee pudding cake with coconut sorbet, or a tangy Meyer lemon tart. Do ask Foreman to pair wine by the glass with each course; you’ll be treated to some of his latest finds. The dining spaces are intimate and romantic, and several private dining rooms, including the Palm Room with its Italian silk walls and marina view, are available for parties or business meetings.